CHICAGO -- The Blackhawks have brought the Stanley Cup back to Chicago after 49 years. Sounds like a good reason for a parade in the Windy City. Fans were gearing up for Friday's ticker-tape parade, snapping up championship T-shirts, flags, pins and hats as the city prepared for an onslaught of happy supporters expected downtown to greet the triumphant team. Chicago resident Don McCauley said even an afternoon game between the city's baseball rivals, the White Sox and the Cubs, couldn't keep him away from the celebration. "It is summertime. It is a beautiful time to be in Chicago. I don't care if I had Cubs-Sox tickets, I'm going to be at the parade," McCauley said. "It's just going to be electric." The parade will begin at 11:30 a.m. ET at the intersection of Wacker Dr. and Washington St. It will proceed east on Washington St. to Michigan Ave., then north on Michigan Ave. to Wacker Dr., a.k.a The Magnificent Mile. A championship rally will begin at approximately 12:30 p.m. ET on a stage at the intersection of Michigan Ave. and Wacker Dr. Suburban Chicago resident Morgan Mowry hoped to get a glimpse of the Stanley Cup and see one particular player. "Marian Hossa. I love Marian Hossa," she said. "I'm wearing his jersey right now." Her boyfriend, Ray Dignan, said he approved of his girlfriend's love for Hossa. "He's a hockey god," he said. They were among the giddy fans in Hawks garb wandering Chicago's streets Thursday. Many had been up all night following the Blackhawks' 4-3 overtime victory against the Flyers in Philadelphia Wednesday. They lined up at makeshift kiosks to buy anything with the team logo. Michael Pigozzi was selling Blackhawks gear along the Chicago River downtown, from a $5 pin to a $150 jersey. "We didn't even have the T-shirts out of boxes and we were selling them wildly this morning," Pigozzi said, his pockets stuffed with cash. "I've never seen it like this before." John Stibal of Chicago bought T-shirts for his sons, ages 11 and 16. 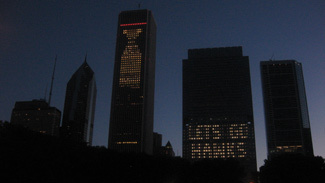 "They have been following the Blackhawks for a couple of years and they're excited about it," Stibal said. "I told them this hasn't happened in my lifetime so they realize it's a big deal." With the Blackhawks winning the Cup for the first time since 1961, Friday's parade was expected to draw thousands -- if not hundreds of thousands. City officials hesitated to provide specific projections. "We're preparing for very large crowds," said Will Knight, a spokesman for the Chicago Office of Emergency Management. Chicago Mayor Richard Daley said money for the event was coming from sponsors, not taxpayers.